Scrambled eggs turn into a gourmet supper when you add a little fresh ricotta and herbs. Soft scrambled eggs with ricotta and chives! Your new favorite comfort food supper. Okay, so this is one that doesn’t really technically qualify as a recipe in my book. I mean, it’s scrambled eggs. The dog can almost make scrambled eggs. But then it occurred to me…there are scrambled eggs, and then there are soft scrambled eggs with ricotta and chives stirred into them, drizzled with olive oil and eaten at the end of a long, long, long day when all you want to do is put on your oldest, softest pajamas and eat perfect scrambled eggs. And click here for the full recipe for making your own dreamy ricotta cheese. Meanwhile, a handful of chopped fresh chives gently stirred in, drizzle the whole thing with a little olive oil…and I promise, you will never ever think of scrambled eggs the same way again. Scrambled eggs turn into a gourmet supper when you add a little fresh ricotta and herbs. Whisk eggs and milk thoroughly together (I also like to scramble eggs by shaking the eggs and the milk vigorously in a mason jar. Heat a nonstick skillet over medium heat and add eggs. Cook until eggs are soft-set, stirring gently from time to time. When eggs are just set, gently stir in ricotta and chives. Transfer to plate, drizzle a little olive oil on top and serve. Um yeah…these are NOT your average scrambled eggs. These are wow. Majorly. Wow is the perfect word…and they are so easy to make, which may even be double wow! This sounds fab! I hate any brown in my eggs too. I have a hard time getting them out as they are brown, or the fried ones are crispy brown around the ends and that is a yuck for me. I use cheddar in my eggs,and this week when I went away a woman made my scrambled eggs into an open omelet with fresh mozz. and it was fabulous too. I can’t wait to try it your way! Thank you! Ooooh! I’ve started making my own mozzarella, so this is a perfect thing to try with it – thanks! You cannot go wrong with cheese and eggs, seriously. Yum! Thanks for the fantastic idea! I think this sounds fantastic. While I’m an egg purist, I’ll give this a try. Personally, I don’t add milk. I think whisking the heck out of them before cooking gets the right amount of air in it to make it nice and fluffy. 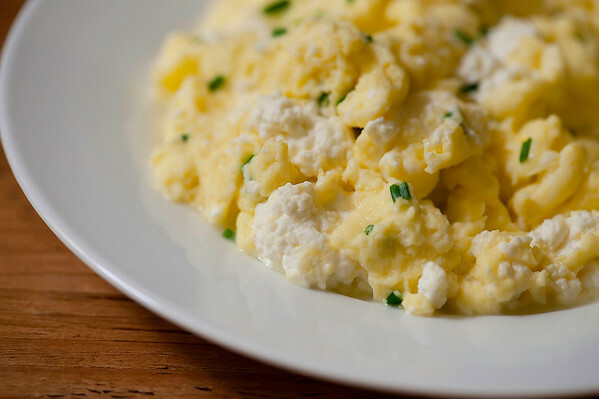 Scrambled eggs with ricotta is THE BEST way. I found a similar recipe about a year ago, and can’t stop raving about it. I buy ricotta at the store, and freeze serving sized portions so that I have it on hand for scrambled eggs. I thaw in warm water, but sometimes have to drain the excess liquid.